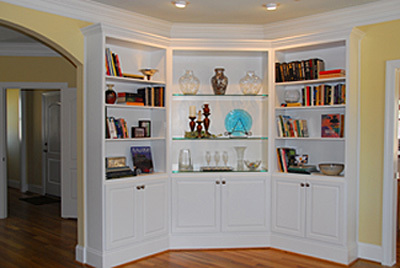 This wall unit consists of three bookcases joined to follow the angle of wall in the customer’s house. It has raised panel doors with custom knobs, classic crown and raised base molding. It was installed with quarter-round at the base and side seems to provide a built-in look, without the expense As with all of our pieces, everything can be built to your specifications.